In a relief for the Modi govt, the Supreme Court dismissed all petitions seeking a court-monitored probe into an alleged scam over the Rafale deal. New Delhi: The Supreme Court Friday threw its weight behind the decision-making process of India’s deal with France for the purchase of 36 Rafale fighter aircraft, dismissing all the petitions filed against it. The decision is a big relief for the Narendra Modi government and means a massive setback to the Congress, which had turned the issue of alleged irregularities into a major poll plank. On the question of Dassault’s choice of Anil Ambani’s Reliance Defence as an offset partner under the deal, one of the main sticking points for critics, the court said it “is up to the vendor [Dassault] and not the central government to decide”. “[It is] not the job of this court to go into it,” the court added. The order came on a batch of petitions seeking a court-monitored probe into the Narendra Modi government’s controversial purchase of Rafale fighter jets from French firm Dassault Aviation. The petitioners include advocates M.L. Sharma and Vineet Dhanda, Aam Aadmi Party leader Sanjay Singh, former Union ministers Arun Shourie and Yashwant Sinha, and lawyer-activist Prashant Bhushan. The top court had on 14 November reserved its judgment on the pleas. One of the pleas, filed by former BJP leaders Shourie and Sinha along with Bhushan, sought court orders for the CBI to register an FIR on the basis of a complaint the trio had filed with ousted director Alok Verma on 4 October. They wanted the court to order a “time-bound” probe, with the submission of “periodic status reports”. The trio alleged that there was “enormous pressure on the CBI because of the nature of the persons involved not to undertake this investigation”. In their plea, they sought directions to the central government to “cease and desist from influencing or intimidating, in any way, the officials that would investigate the offences disclosed in the complaint”. Even as the government — represented by attorney general K.K. Venugopal — defended the purchase, the petitioners sought to poke holes in the deal. The apex court, on 31 October, directed the Modi government to submit details surrounding the purchase of the Rafale jet. 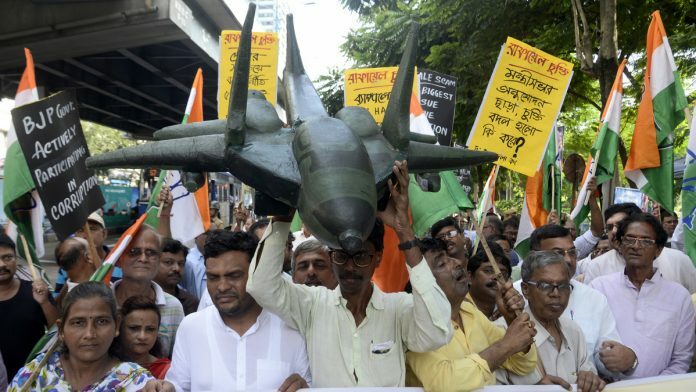 Though the government maintained that it followed all the norms prescribed in the defence procurement procedure (DPP) — finalised in 2013 by the UPA government — it did not detail the steps leading to the 10 April 2015 Paris announcement by Prime Minister Modi and then French President Francois Hollande that India and France were going to sign the contract for the fighter jets. After the order, the Bharatiya Janata Party (BJP) sought an apology from the Congress. “Rahul Gandhi and the Congress should apologise to Prime Minister Narendra Modi for making false allegations against him and questioning his credibility,” said BJP spokesperson Shahnawaz Hussain. Ambani issued a statement as well, saying he welcomed the judgment. “I welcome the judgment… conclusively establishing the complete falsity of the wild, baseless and politically-motivated allegations levelled against Reliance Group and me personally,” he added. This report has been updated with the BJP and industrialist Anil Ambani’s statements. Wisdom of over 100 aircraft came from IAF, who are supposed to fly them to DEFEND OUR COUNTRY. The learned court could have at least asked the Modi government how they could VETO this requirement on their own. Why couldn’t the SC show interest in this fundamental point — who determines a Force’s requirements, the Force itself or some politician? But once the court washes its hands off this basic point, the suitability or otherwise of Anil Ambani becomes a redundant question — when there is no need to manufacture the planes, why worry about the manufacturer! And with this, also the price issue becomes redundant: when the UPA government was prepared to pay 570 X 128 = 72960 crores of rupees, then where is a harm if Mr Modi has paid only 1600 X 36 = 57600 crores!! He has in fact saved money for the country!! Horrible. Absolutely horrible. “Theatre of the Absurd” is a concept and not a physical place like the Opera House in Mumbai, otherwise I would have proudly said, our Supreme Court if the Theatre of the Absurd. I hope I am not jailed for the contempt of court if I say what I’m so tempted to say next: it’s the Opera House of fools. To get votes, Congress/Rahul sold lies to the people of Chhattisgarh, Rajasthan and Madhya Pradesh. Rafale deal SC court order should have come before polls, so that people would have voted without any assumptions. Also UK court verdict on Mallya should have come before polls, so that Congress/Rahul would have got exposed. As a voter, I feel cheated by Congress/Rahul.